SALA Book Club - "A Confederacy of Dunces"
This month we're reading the Pulitzer Prize-winning A Confederacy of Dunces by John Kennedy Toole. "A Confederacy of Dunces is an American comic masterpiece. 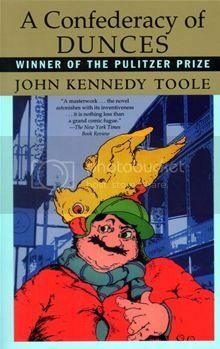 John Kennedy Toole's hero, one Ignatius J. Reilly, is "huge, obese, fractious, fastidious, a latter-day Gargantua, a Don Quixote of the French Quarter. His story bursts with wholly original characters, denizens of New Orleans' lower depths, incredibly true-to-life dialogue, and the zaniest series of high and low comic adventures" (Henry Kisor, Chicago Sun-Times). This month Sharí will be hosting at Crave Cafe in Studio City.